It’s about that time of year for soup and lots of it. I’ve had a variation of this recipe in mind for quite some time now (it actually came to me while I was lying in savasana in yoga class – go figure), so I’m happy it now lives on the blog. This soup comes together in 1 pot in 30 minutes! Easy peasy. We start by sautéing garlic, shallot, ginger, and serrano pepper until tender. Then add carrots, which are the primary vegetable in this soup. However, you can also sub other seasonal vegetables, such as sweet potatoes, parsnips, or even pumpkin. Something hearty is preferred. Next comes vegetable broth and a little coconut milk for flavor and creaminess, along with the lentils for plenty of plant-based protein and fiber. I love the flavor of our DIY Curry Powder, but you can use store-bought (or a similar blend of spices) as well. Coconut aminos adds a little more body and depth. Once the lentils are tender, it’s time to dig in! This would make the perfect dish when you need something nourishing and delicious on the table fast. It’s tasty on its own, but it would also pair well with things like our Curried Quinoa Chickpea Burgers, Spicy Mango Chutney, and Savory Abundance Kale Salad! For more nourishing soups, check out our 1-Pot Vegan Minestrone, Sweet Potato Black Bean Chili, Fire-Roasted Tomato & Mung Bean Soup, Romesco Soup with Smashed Chickpeas, and 1-Pot Everyday Lentil Soup. 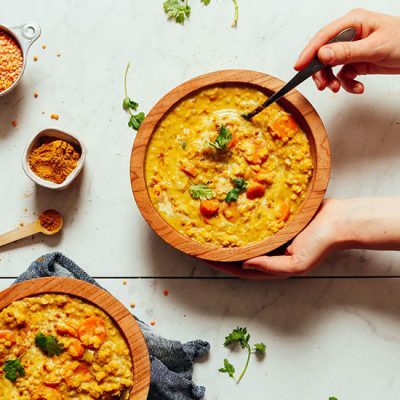 1-pot goodness in the form of curried lentil soup! Rich with flavor, fiber, and protein and incredibly comforting. The perfect 30-minute healthy meal or side! Heat a large rimmed skillet or pot over medium heat. Once hot, add water (or oil) and shallot. Sauté for 3 minutes, stirring frequently, until softened and slightly browned. Add garlic, ginger, and serrano pepper and sauté for another 2-3 minutes. Then add carrots and a pinch of salt and stir. Cook for 1-2 minutes more, stirring occasionally. Add vegetable broth and coconut milk and increase heat to medium high. Bring to a low boil. Then add lentils and stir. Once the mixture comes back to a low bubble, reduce heat to low or until you achieve a gentle simmer. Taste and adjust flavor as needed, adding more salt or coconut aminos for saltiness / depth of flavor or more curry powder for intense curry flavor. Divide between serving bowls and garnish with fresh cilantro and lemon juice or a little fresh coconut milk or cream (optional). Store cooled leftovers in the refrigerator up to 5 days or in the freezer up to 1 month. Reheat on the stovetop until hot, adding more vegetable broth to thin as needed. Made this for the second week in a row! Stirred in chopped Kale and served over roasted cauliflower this time. YUM! This is one of my favorite soups to make. This is a “go-to” soup recipe for me. I almost always have everything I need on hand and so this is the soup I make when it’s one of those days when I don’t have a plan for dinner and I need to make something quick and easy and I don’t want to stop at the store. We usually eat it with a loaf of sourdough bread. I make it completely according to the recipe, but omit the peppers because I am cooking for three young boys as well and 1 of them loves the heat but the other two don’t! I always hope/assume there will be leftovers for the next day, but sadly that is rarely happening. It’s time to start doubling my batch! Ok, WOW! This was amazing! It’s great as-is, but I’ve also added canned tomatoes, chopped spinach, and a little turmeric and it was fantastic that way too. Just made this and WOW! It is seriously so delicious and was sooo easy to make. Definitely a 5 star recipe! I love this recipe and have made it a bunch of times now. I have doubled it, still comes out great. I have varied the heat with different Chile’s and curry powder mix. I have also made it with butternut squash instead of carrots. Also delicious, but I personally prefer the texture of carrot slices. Most of the ingredients are ones I usually have on hand, so easy to make when I don’t have time to go out to the store. So flavorful and satisfying, definitely one of my very favorites. Made this last night, then my son and I argued for 30 minutes who was going to “marry” this curry and then I had to make a second batch because there wasn’t enough left. Then I dreamt about it. It was seriously that amazing. Then this morning I gave some to my coworker who is a native of India because she’s always bringing me amazing food to try and she loved it! I can’t thank you enough. This is the most amazing recipe. I made this yesterday for supper. It was so simple- it was ingredients I had on hand and it was quick. Even my 14-year old son LOVED it! This is definitely one I will make again. 1) I cook regular green or brown lentils ahead and freeze them, so I just have to heat them up in the soup. 2) I keep canned pumpkin on hand and substitute it for the carrots. 3) I keep canned chopped chiles on hand to substitute for the fresh pepper. I have the remaining ingredients always in my pantry. It’s just a matter of sauteing the onion, garlic, ginger and the curry powder, then dumping the remaining ingredients into the pot, heat it through, and I have soup in minutes! Thank you, Dana! I love this soup! It’s so easy to make, filling and DELICIOUS! I like to skip the sauteing of veggies in oil and instead use the suggested water method, and in a separate skillet, gently toast the curry powder mix w/ a little coco oil. Then I transfer it when it’s time! I find this makes the soup even more flavorful. I also like to use full-fat coco milk and use 1/2 cup, rather than 3/4 light. Any root veggie will work indeed – I really enjoy a combo of sweet potato and carrot. So good, esp. w/ fresh lime juice and cilantro upon serving. Thank you for such a lovely recipe! This is a 10 star recipe. Can. Not. Get. Enough. Of. This. Soup. Phenomenal!!! Nitty gritty: I used water instead of oil, forgot to buy the serrano pepper (so I subbed 1/4 tsp. chile flakes), subbed tamari for the coconut aminos. It took me far longer to cook the soup than 16 minutes (more like 45, but I seem to cook slow), cause the carrots wouldn’t soften (?). I ended up adding a tetra (32 oz.) low-salt no chicken broth, and only added 1 tbsp. of tamari to start (watching salt intake). I ended up adding another tsp. of tamari, but dumped in a few tbsp. of fresh lime juice at the end, & topped the soup with a lot of cilantro. Oh and I used store bought curry powder. Let me tell you, this is one of the best soups I have EVER made. My only regret was that I didn’t double it (plus I wouldn’t have leftover coconut milk). You guys, MAKE THIS!!!! You will NOT be sorry!! And your taste buds will go cray!! Aww, thanks so much for the kind review, Wendy! So glad you enjoyed it! Wow almost ate everything all by myself! It is the third recipe I try from this website and so far everything is absolutely delicious. I put shopped cilantro in the pot directly at the end and added Garham masala spices. Feels nutricious and I can’t get enough. I’ve made this several times and it’s my new absolute favorite! I cooked the carrots in the broth till soft and then used an immersion blender to purée everything before adding the lentils and it’s just the yummiest. I made this with a large jalapeno, used soy sauce instead of coconut aminos (used half the amount), and unsweetened almond milk since I didn’t have coconut milk on hand and didn’t feel like going out to get some. It was delish! Also super affordable for my college budget. Just the right amount of spice. When I have sweet potatoes on hand, I will definitely add them to this recipe. This was amazing! Full of flavor and next time I will double the recipe because we all went back for a 2nd bowl so there were no leftovers! This recipe was amazing!! Full of flavor and will double next time because we went back for seconds and had no left overs! I have made this several times. Love it! I dial back the curry powder a bit because I’m a spice wimp. Today I made it in my instant pot to save time. Doubled the recipe, and did it on high pressure for 6 minutes, natural pressure release. Whoop! We’re glad you enjoyed it, Katy! I am new to vegan cooking and followed this recipe almost exactly, except I substituted soy sauce for the coconut aminos and used Persian lime flavored olive oil. I also left the seeds of the chili pepper in, and I used freshly squeezed coconut milk. This is the bomb! Choo Hoo! Fa’afetai tele lava! I’ve made this several times now and it has become one of our favorite soups. My husband loves it! I was worried about the hot pepper but was surprised how tame it really is after cooking. Thanks for the awesome recipe, as always! I toasted dessicated coconut at the beginning and used evaporated skim milk in place of coconut milk. A thicker soup with the coconut and a nice tasty and sustaining soup. Delicious!! I used brown lentils because that’s what I had on hand and just simmered it about 30 minutes total and it was perfect, thank you for a great recipe! Great! Thanks for sharing, Susan! I altered the recipe by toasting coconut at the beginning after the sauteed onions. The coconut milk I substitued evaporated skim milk in the same quantity. These to ingredients were to replace the coconut milk. Lovely flavours in this recipe….I am wondering if I could use fresh curry leaves at the beginning to give a different depth of flavour. Whoop! We’re glad to hear that, Kendall! This was delicious! I used sweet potato and carrots, like other people had mentioned in the comments. The only change I made was to saute the shallots in a little oil and to add the curry powder to the pan to bloom the spices before the liquid. I made it for a group of friends and it was extremely popular. I thought the coconut cream was a delicious addition. Great recipe, thanks! I doubled it, added a couple of potatoes and a little cayenne pepper. I am definitely looking forward to leftovers. Whoop! Glad to hear it, Stacy! This was delicious!! I added extra veggies, the whole can of coconut milk and turmeric. Will definitely make again! Thanks for sharing!! I can’t eat onions or garlic-suggestions? I would recommend leaving them out, subbing a garlic-infused oil, OR using asafoetida, which is an Indian spice that tastes like onion and garlic. Start with 1/4 tsp and work your way up for more flavor. This was delicious!!! I am definitely going to make this again. So tasty! Thank you! Is it possible to sub chickpeas for the lentils? Its worth a shot, though we haven’t tried it ourselves and can’t say for sure! Very good. Used 4 cups chicken broth. Served it with rice. We all enjoyed it but my one year old loved it. She ate her whole bowl! Win win! Yay! Glad to hear it, Kelli! This recipe is amazing! I have made this a few times for meal prep and it is so easy, so flavorful and perfect for fall and winter. Love the soup. So delicious!!! This is the fourth time I’ve made this…because I love it. Something happened during the second and third time I made it…it was WAY too salty. So this most recent time I decided to leave out the coconut aminos (which, I was using tamari…was that a bad sub?) and it’s perfect. Just in case you’re having the same issue, I wanted to share. Thanks for the great recipes! 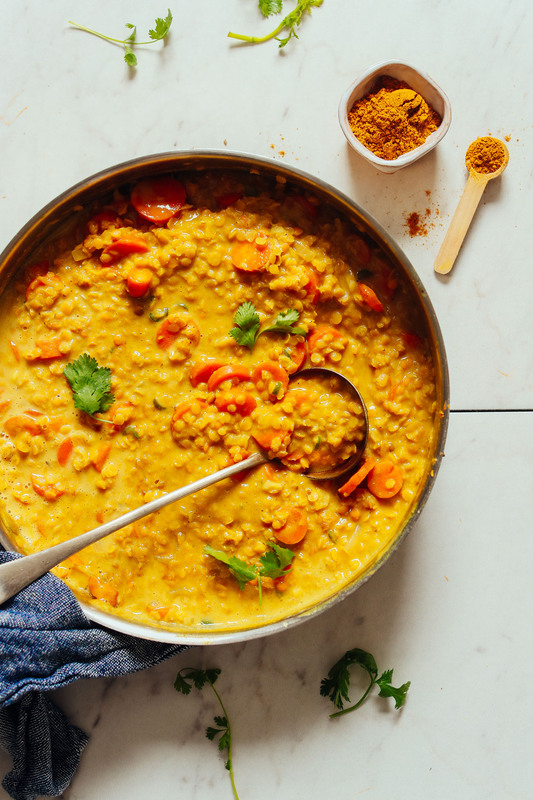 I’ve made other red lentil dal recipes and this one wins!!! My family just loved it! I made it last night for dinner, along with your naan recipe. So stinkin’ delicious! I’ll be making it again for sure :) Thank you Dana! This one is in our regular rotation now. So good. I like it with the pepper for the heat. We love the flavors. This was delicious! I added an entire can of coconut milk + the broth, and doubled the amount of curry powder. I also added turmeric, 1 TBSP coconut sugar, and tofu. This might be my new favorite! Yum! Thanks for sharing your additions, Ariel! Delicious! But I had a problem. 3 cups of broth left barely a cup of broth. I later added another 3 cups of broth and more coconut milk. I could have tripled the amount of broth and coconut milk portions to really have it become soup. To me it was a stew without more broth. I substituted a red chili since I didn’t have a Serrano. I also doubled the curry powder and amino acids since I add more broth. I used sun brand madras curry powder. I also added steamed broccoli. I loved this recipe except the broth issue. I will make it again. Perfect comfort foodie a cloudy day. Thank you! Oh! This was delicious. I didn’t have a Serrano but did have a large pasilla pepper. I also added some red pepper flakes to make up for the heat that the Serrano would offer and topped bowl off with shaved fresh coconut. Even non-vegetarian family members enjoyed it. This is a keeper. This was crazy good. I omitted the pepper since my daughter hates spicy, but otherwise followed the recipe and we were not disappointed!!!! Garnished with some fried sage and served on sautéed kale and we were in heaven! Dana…this was amazing!! You know when you’re full but you don’t want to stop eating because it tastes and feels so good? Yeah, that was this! I used 2 large carrots and added fresh broccoli and frozen peas at the end. I also didn’t have coconut milk so I used about 1/4 cup coconut butter and added extra broth to compensate for the lost liquid. I served it topped with cilantro and cubed avocado for a bit of coolness. SO GOOD! Thank you. This was easy to make and a joy to eat. I added a couple of portobello mushrooms (chopped) and used sweet potatoes instead of carrots. Also opted for a jalapeño pepper instead of a Serrano. Also added black garlic along with the fresh. So much umami. Yum! Spot On! As usual. Made this last night – I only had 1/2 the amount of carrots and even so it was delicious. So easy to make and it didn’t leave the kitchen a mess. Thank you – this will become a Fall staple. Just made this for lunch on the first wintery-ish day here in Indianapolis. It was very filling, super potent, just wonderful. Followed directions exactly- used onion instead of shallot (didn’t have shallot on hand); used red lentils vs yellow; used the last of my jalapenos from the garden instead of serrano, I left a few seeds in and it was spicy, kind of a creeper where it seems fine until you stop and then you find yourself breaking into a subtle sweat and your nose is running. Very, very good, just how I like my soups! I also am a big fan of Penzy’s Curry Now, which is what I used. It has a ton of flavor, big chunks, not a finely ground curry powder. LOVED THIS SOUP!! Will be making it again and again! THANKS! Yay! We are so glad to hear that, Beth! Followed this recipe exactly other than doubling it and was amazed by how good it is! So much flavor. Loved using coconut aminos! Thank You! This is one of the most delicious, warming things I have made. I dialed up the curry powder a little and used half sweet potatoes & half carrots. Don’t skip some fresh cilantro on top. Next time I might cook the veggies a bit longer before adding the lentils and bloom the spices in the oil/ginger/garlic/serrano mixture before adding the liquid. Is there a slow cooker way of making this? I’m brand new to cooking and I’ve been experimenting a lot lately. My first try for this soup was a 150% success ! I didn’t have all the ingredients (serrano pepper, vegetables broth and aminos) but, 10/10 anyway. Tasty, creamy and *omg* delicious – my husband (and coworkers – we usually bring our homemade lunch to work, so I gave them a try!) loved it so I’ll keep this reference! Thanks for sharing this delicious recipe! Love all the healthy recipes you provide and this one is exceptional. I added sweet potatoes and I think it gave it more depth of flavor. Perfect for fall! I made this according to the recipe published here. I tasted it just before the lentils were tender, and then increased the curry powder to 3 tablespoons. Yum, yum! My husband and I declare this soup to be a keeper. Thanks again for a really good recipe! This recipe makes a truly delicious & hearty soup. Absolutely scrumptious! I only had green lentils, & was short on shallots, so I used what I had, added some sweet onions, & it turned out unbelievably great. Thanks for this one! What a great, tasty recipe! The curry powder and the ginger really gave it this warmth! I actually added some sweet potato to make it more of a meal soup and it was a great addition! My best friend absolutely loved it! Maybe a handy tip! :) thanks for creating this! I’m making this tonight for the fourth time. My wife can’t get enough of it! We add roast cubed eggplant for about 10 minutes and then add it while everything’s simmering away. For lunches during the week I put it on top of some quinoa; by the time I have lunch at work everything’s mixed together and it’s so flavourful! One of my favourite Minimalist Baker recipes (and that’s saying a lot). Delicious soup and recipe is accurate and easy to follow. This was so simple yet SO TASTY. Only modification was that I excluded the serrano pepper because I’m a wimp when it comes to spicy things. Will definitely be making another batch to freeze for maternity leave! I made this last night and it is absolutely delicious! The smell and taste reminded me of my mum’s chicken curry – now i am vegan i have found a great alternative. Thanks Dana for yet another great recipe! 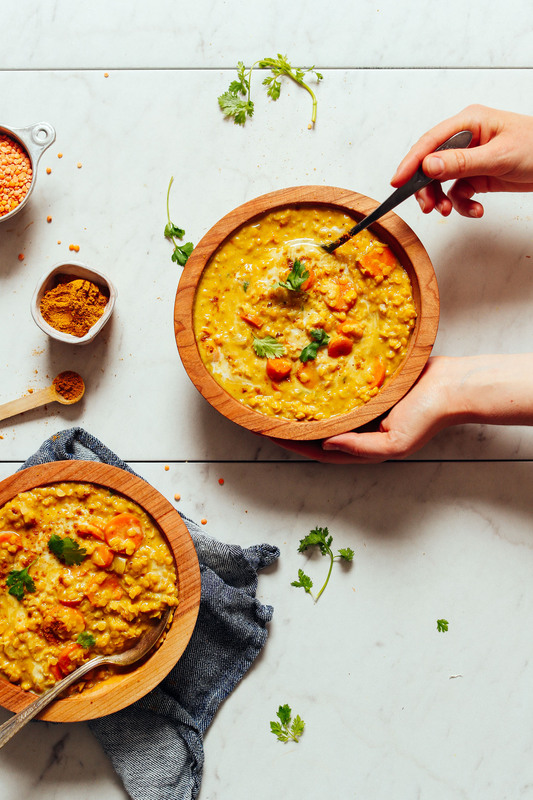 Your coconut curried lentils are one of my favorite things to make so obviously I had to give this a try! This is delicious as well! I didn’t have a pepper so I used some cayenne at the end instead. For veggies, I added cauliflower with the carrots and a few handfuls of spinach when it was done. Then I paired it with some avocado toast for dinner. So good! I used brown lentils and it turned out great. added sweet potatoes/Yukon/carrots in effort to use up stuff in the house, added chick peas, and then kale at the end. Took about an hour to cook. Very yummy and fragrant! Thanks for the recipe! I just made this, wow, so flavorful! This will be the first of many bowls! I made this soup last night and it was delicious, hearty and satisfying. I uses more shallots than called for, and added some cubed Delicata squash ( a suggestion in the recipe), which was really complimented by the flavorful broth! Thank You so much, this is a real keeper!!!!!!! next time I’m going to double it. The metric version of the recipe lists the measurement for the shallots in millilitres rather than grams. Ml is for liquids, not solids. We’ll check it out! Thanks, Lo! Just made this tonight and I am squeezing my eyes and smacking my lips cuz it’s that good. I have always wanted to make curry like this but just settled on store bought pre-made curry seasoning/blocks. But not taahhhdaayyy! I followed the recipe exactly (except I forgot to buy fresh ginger and I did not have coriander so I just left those things out—did not substitute) and this curry is still monneeyyy. Ugh. So good. And I’m a newly converted vegan. And a foodie. So my raving opinion on a healthy dish like this really matters, you know? Haha. Make it. And make it like Dana says! Last note:I splurged and got coconut aminos instead of subbing soy sauce and I’m a BELIEVER people! Get the aminos. Now excuse me while I help myself to seconds. Yay! Thanks so much for sharing your experience, Dom! Really so easy to make and super tasty. We used whole coconut milk (couldn’t find lite in the store) and tamari sauce and it was absolutely delicious. Threw in some kale in the last few minutes and it was perfect. Wow!! What a fantastic recipe! This recipe was simple to make and had a beautiful and complex flavor. It also smells amazing. I can’t wait to make it again. I felt like it was restuarant quality worthy, but again so simple to make. Thank you, this one is a keeper!! Just made this today – so delicious. So flavourful and filling! I love that it’s not many ingredients and comes together so quickly and easily. Definitely going to be a repeat recipe. Wow! Wow! Wow! So tasty, so delicious. Made it with 1 parsnip and 1 carrot. I also used 4 cups of broth and a whole can of coconut milk (just didn’t want to waste anything) and added a bit more garlic and ginger to make up for the excess liquids. Phenomenal. Thank you! You’re the best! Yum! Thanks for sharing, Michelle! I have made this soup three times in as many weeks. It is super easy, inexpensive and is honestly one of the most delicious soups I have ever tasted. I didn’t have coconut aminos so I made it without, but used full fat coconut milk. Mmmmm! A real crowd-pleaser at my Thanksgiving dinner! So tasty and hearty! I doubled the recipe and subbed vegetable broth for water and added extra carrots and lentils. Worked like magic in an instapot. Keep the winter recipes coming!!! Yay! We are glad you enjoyed it, Natalie! Thanks for sharing! This is so good! I’ve made 2 double batches and eaten 2 double batches! The only changes I make is sauting with water instead of oil and I add about 2 tablespoons of chili garlic sauce toward the end. Great for lunch at work! Thanks! Hi! This was so good!!! I used 1 cup carrots, 1 sweet potato, Bragg’s liquid aminos and red pepper flakes! I also threw in some leftover rice and chickpeas plus a handful of spinach. My husband loved it too! Thank you so much! I just made this! I pretty much followed the recipe exactly but I probably needed one more shallot so I added some thinly sliced red onion, and I had Bragg’s amino acids in the pantry already, so that’s what I used- reallyy delicious! I’ve scooped it into containers for my lunch for the week. Am I the only one that fakes humility when I’m heating up my veggie yumminess in the break room then someone gushes about how good it smells while eating their craptacular lunch?! Oh, that’s just some golden curry lentil soup I threw together last night, I’m going to say quite nonchalantly. Thanks for another wonderful recipe Dana! Made this tonight and absolutely loved it! Easier than expected and so, so filling. Love the spicyness and the rich curry flavor! Completely delicious!! Made as written, including adding more coconut milk, coconut aminos, and curry powder at end. Serving sizes were plenty generous for us. Can’t wait to have leftovers tomorrow. Thank you Dana for all your recipes which have brightened our table. We also appreciate how you include all types of eaters. Yay! We are so glad to hear that, Laura! I just made this and it’s soooo good! Can you please tell me the measurement for 1 serving? We are glad to hear that, Liz! Serving sizes are ~1.5 cups each. I died and went to heaven when I ate this! It has everything I’ve wanted. My omnivorous husband made this and it turned out wonderful. We used yellow onion instead of shallots and extra peppers for spiciness. We paired it with some toasted pita bread and fresh cilantro and lemon. Absolutely wonderful. You’ve outdone yourself again, Dana, thank you! We are so glad to hear that, Lindsay! Thanks for sharing! Yum! This is a great recipe, easy and delicious. It pleased both the vegans and meat eaters. I used garam masala plus some tumeric in place of the curry powder because I was out. Used tamari instead of coconut aminos, and added a small chopped zucchini near the end of the cooking time. I was amazed at how fast it came together. I will definitely be making this again, maybe a double batch in the hope that there will be some leftovers next time!! This is a very delicious soup that warms you from the inside out. I used 1 Tablespoon Braggs liquid aminos instead of the 2 T coconut aminos. I used store bought curry powder. Left overs are great in a bowl over some leftover grains, add some veggies of choice and voila another meal! 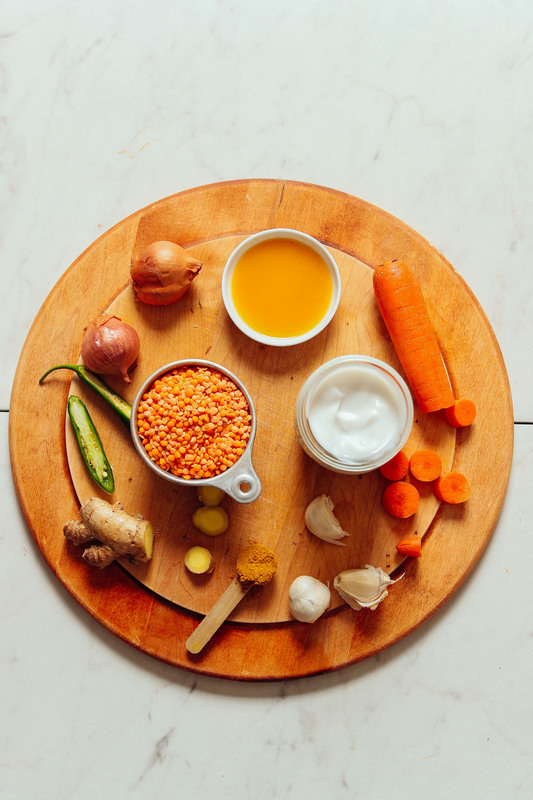 Lentil soup is a favorite of mine! My mother generally used green or brown lentils and added in carrots, sweet potato, bell peppers, celery, and lots of onions and garlic when she made this soup for a nice dinner. I love how healthy this soup is without sacrificing all the flavor! Can’t wait to make this again! So good and easy and super healthy, this will definently be a regular in our meal planning rotation! We are glad you enjoyed it, Tamara! This was delicious! I added some purple cabbage (trying to get in those healthy cruciferous veggies). Thank you for another great recipe. Yum. This is a true winner! It was so fast and my family loved it. I used sweet potatoes instead of carrots and spinach at the end to get more greens in my 4 year old. Thanks for the great recipe! I’ve said it once, and I’ll say it again— your recipes are nothing short of genius. This was so freaking good and easy to make! A Fall staple for sure, will definitely be making it again soon. Amelia – so kind! Thanks for sharing!! I made this recipe when it came out on my feed not realizing it was a new recipe. It is so simple and flavorful. Hubby ate 2 bowls the first night and moaned even more the 2nd day once it sat. Highly recommend. Be sure to NOT soak the lentils! I thought that no way this recipe would take only 30 minutes without soaking the lentils and ended up with a very thin soup. Added some cornstarch to save it – the flavors were wonderful though! Ha! Thanks for sharing! Red lentils cook quickly! I did go ahead and use a full can of coconut milk and 4 cups of veggie broth because 1.) red lentils fall apart and thicken easily and 2.) I thought I might as well use up the rest of the can of coconut milk and box of broth. Because of that, I added some extra lentils, curry powder, and amino as well. Turned out PERFECTLY! Thanks for the inspiration! Yay! Thanks for sharing, Molly! I followed the recipe pretty close except instead of serrano pepper I added 1/8 tsp cayenne pepper. Too much spice still for my partner, but I liked it! Also used regular canned coconut milk and instead of light because it’s what I had on hand. Tip: Steps 1 & 2 I had to add more water to while cooking to keep from burning (I didn’t use oil). However, I did not need to thin it out in later steps. The flavors were great! I liked that most of the ingredients I already had. If I had some avocado I would have also topped with some. Finally,, the recipe took a little over an hour to complete. My partner prepped the ingredients and then I cooked them. All in all, would make again! Lovely!! Thanks for sharing, Donna! We have a winner folks! I cook a lot of your recipes…I mean A LOT. And I love them all. But my husband said this was the best thing I’ve cooked yet. Thanks Dana! So creamy and good. My only feedback is that the portions were a touch slim for 4 hungry people. We will definitely double it next time, because I imagine it makes really good leftovers too. SO so kind! Thanks, Jamie!! WOAH! This is so good, I’m trying not to eat it all in one sitting. This is definitely going to be a meal I make frequently and I think I might even try freezing some. Thanks! Yay! Thanks for sharing, Cami! Also, if you wouldn’t mind adding a rating next time that would be amazing. It’s super helpful to us and other readers. xo! Made this recipe tonight, a big hit with the hubby. Was going to make a big batch of this and a big batch of regular lentil soup, but the revular batch never got made because I have to make two batches of this one!! One change…I added sweet potatos and it was a big hit. THANKS, will mzke/freeze this often! Lovely! Thanks for sharing, Valerie! And if you wouldn’t mind adding a rating next time that would be amazing. It’s super helpful to us and other readers. xo! Thank you for sharing, Greta!! This was amazing!! I used sweet potatoes instead of carrots and it worked wonderfully! Smart!! Thanks for sharing, Anna! Another AMAZING recipe!! My family loved it! Made this a few days ago in the slow cooker by pre-sautéing some onion and tossed everything in for 4 hours on high, then chose to blend it for a smoother version. I forgot to buy the pepper and it was still great without, but I imaging that adds some nice kick. I also used regular milk instead of coconut milk, trying to use what’s on hand. Love how delicious, simple, and budget friendly this is. It just snowed a ton here and this is a perfect recipe for the cooler temperature. Lovely – thanks for sharing, Rebecca! So delicious I just made it with some ginger garlic rice and I’m pretty sure this is the best thing I’ve made. Maybe ever? Thanks Dana for all the work and creativity you put into making the best vegan dishes. Whoa – thanks for sharing!! This was amazing! Will make again for sure. The whole family was wishing for more. Used chicken broth because that’s what I had on hand, and also regular coconut milk for the same reason. Soy sauce instead of aminos. So good! This recipe is as delicious as it looks. We absolutely loved it! I worked with products I could find: red/green/black lentil trio, canned coconut milk, 1 T. low sodium soy sauce, no pepper and regular onion. It really was easy and a huge hit. We are glad to hear that, Debra! After a seemingly endless summer in Southern California, I made this today in celebration of the first day that felt cool enough to call “Fall.” This curry is perfect — perfect spiciness as written! And QUICK to make (truly “one pot”) after a long day at work! I topped each bowl with salted peanuts, which added crunch to each smooth bite. Thank you! Yay! Glad to hear that, Susan! So yummy! Used sweet potatoes instead of carrots – into the Instant Pot for 5 minutes NPR. Delicious! Thank you for the inspiration! Great! Thanks for sharing, Rebecca! Simple, quick, and tasty. :) I used 2 cups of vege broth to make it more of a curry and had it with rice. I meant to but it didn’t save and I couldn’t figure out a way to edit or delete the comment sorry! I’ve put a 5 star on this rating haha. Delicious! I used jalapeño instead of Serrano, as it was all I could find, and added a bit of coconut cream to the soup near the end to make it creamier. Turned out great! Yay! We are so glad to hear that you enjoyed it, Esther! Amazing soup. Made this tonight. Only had one carrot- added a potato. No aminos- added white soy and some coconut sugar. Perfect! Great! Thanks for sharing, Don! Pardon me while I finish off my second full bowl of this amazingly delicious soup. DO NOT and I repeat DO NOT make a single recipe. You will want to quadruple this. My husband made this for dinner tonight and we sadly watch as we emptied the pot and had none left for lunch tomorrow. He suggested we make it again tomorrow night so we could have leftovers. I wish I had read this before making my soup. We had the exact same regrets and are definitely making this again tomorrow night! Great dish! I used a bell pepper from our garden. We ate this curry with Beyond Beef grilled sausages. It was a hit! This was a great recipe! I ended up doing half carrots half sweet potatoes, which was a nice combo. I thought I had fresh ginger on hand, but it turned out I did not, so I used ground ginger. Finally, I didn’t have a serrano pepper and decided to sub with some smoked paprika. Wonderful flavor and I’ll definitely make it again! Lovely!! Thanks for sharing, Kelley! I just made this. It’s *so* delicious. 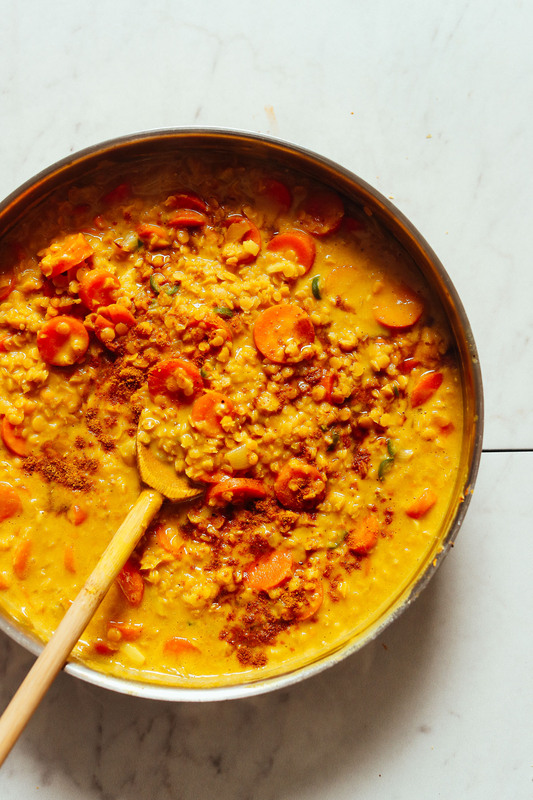 I’ve been cooking with red lentils for years and have never found a recipe quite this amazing for them. It’s game over, this will be my forever go to recipe. Made this soup today!.. I loved it! My grown up sons loved it! I added cubes of butternut squash and sweet potato.. delicious! It’s in my go to recipe folder with many of your other great recipes. Thank you! Thanks, Lesley! xoxo! Love the addition of winter squash. This is my favorite recipe of yours! So delicious! I substituted a Jalapeño pepper. Spicy and so yummy! Love this recipe! A new go-to for fall. Used black lentils and added spinach and shitaki mushrooms. Lost the beautiful orange color, but not the taste! We’re so glad you’re enjoying it, Channing! Another amazing curry recipe!. I used 2 cups butternut cubed butternut squash and 1 cup carrot. I also added 2 TBSP coconut sugar — you taught me this in your other curry dishes and I love the flavour it brings to curry. Yum! Thanks for sharing, Barb! Just made this and it’s extremely delicious! However, I did modify it quite a bit as I didn’t have some of the ingredients. Added garam masala + tumeric instead of curry as I didn’t have it haha. Also no pepper, and dried ginger instead of fresh. I’m sure the original would be awesome too! Thanks for sharing your recipe changes, Maggie! Absolutely delicious! I went a little more decadent, and used a whole can of coconut milk and less water. Thanks for another amazing recipe, I will definitely be making this again! Wow! this recipe hit my inbox at just the right moment. So easy and so damned good! This is a keeper for sure. I’m just so happy with how tasty and satisfying your recipes always turn out to be. Whoop! Glad to hear that, Julie! Smart! Thanks for sharing, Laura! We haven’t tried that preparation, but if you do let us know how it goes! Hi Breeanna! I tried this in the crockpot with success – first sautéed some onion a bit, and then tossed everything into the slow cooker on high for 4 hours. I chose to blend everything after so wasn’t worried about anything getting too soft, if you are maybe check it a bit sooner? This looks so delicious though, glad your wandering mind benefits all of us! haha, I know! I try! Sometimes I’m successful. Thanks for the reminder! If I use brown lentils, any suggestions for what I need to do differently? Thanks! It will just need to cook longer. Or, you could cook the lentils separate and add them in already cooked. Any suggestions on a replacement for the coconut aminos? Not sure I will find that locally. They sell it at Trader Joe’s for much cheaper than other stores! Think of it as tamari sauce but a tad sweeter! We love it! Thanks, Kiti! Jan, you can also see my suggestions above! This looks very, very enticing & I can’t wait to try it. Tho coconut amines? I’ve never heard of this before. I see 1 bottle is very expensive. What does it bring to the recipe? Also, in what other types of recipes might I use coconut aminos? Yes! Thanks Meg – that’s correct. I use coconut aminos as a soy-free flavoring that mocks soy sauce in our recipes. So use tamari (or soy sauce if not gluten-free) and start with a slightly lesser amount as tamari can be quite salty. This looks great. Any advice about doing it with the Instant Pot? Hi Christy. We don’t have an instant pot but are sure it would work. Let us know if you give it a try! 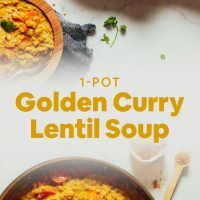 I haven’t made this yet either, but I just saved it in my Instant Pot recipes tab in my email. I would follow all the steps in the recipe, then lock the lid on, press the Manual/Pressure Cook button depending on what IP model you have, and set the cooking time for whatever kind of lentils you’re using. Use a 10-15 minute natural release. 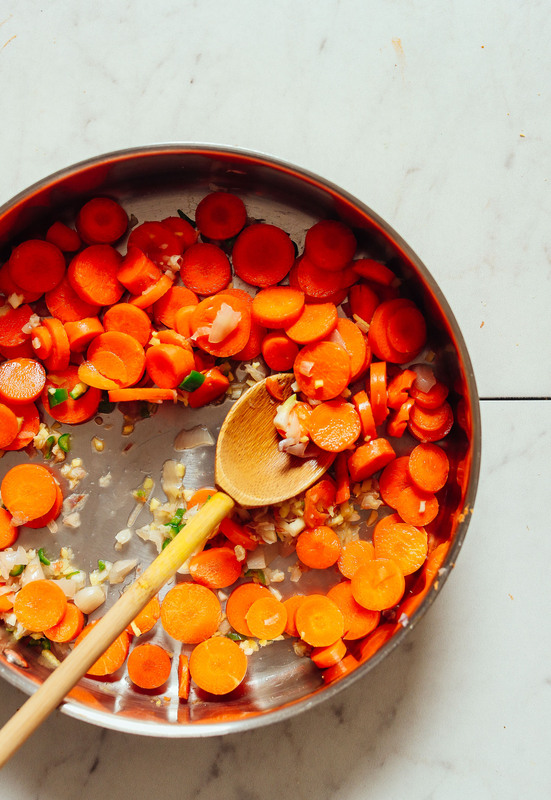 The only problem would be that your veggies will probably be mushy, but you could add the carrots after you release the pressure, hit the Saute button, and let them cook. If the meal only takes a half hour to make on the stove, I’m not sure if there would be any advantage to making it in the IP. Eager to see what your experience is though since I love my IP. Hi! So, I JUST made this. And I was “skeptical” as I am a huge fan and maker of the Curried Coconut Lentils. So I was thinking, “How is this all that different?” And ingredients-wise, it’s not! While in terms of flavor there is a crossover, in terms of a meal it’s very different. It’s clearly a SOUP and not a CURRY. (But I’m sure you could use either to cover cauliflower rice!) I’m so glad I tried it and it’s perfect for the cooling temperatures of the Midwest. Thanks yet again! yum!!! This soup looks amazing! So comforting. I really enjoyed this recipe! It’s so simple, real quick, and so warmingly delicious. One of my favorites! This will be in my weekly rotation from now on! Wow…this recipe was so easy and SO delicious! Really happy with it. I did not use the chili as I am sensitive to spicy but found it with a bit of a kick enough for me with just the ginger. I used regular coconut milk as I didn’t have lite in the house and I used 1 cup of bite size cut up yellow potatoes along with the carrots. Was absolutely yummy. LOVE these one pot recipes! Making this today but without the pepper. Any subs for Serrano pepper? So, I just used green pepper and it was perfect. Thanks, Danny. Jalapeño is great, too. Can’t wait to try this this weekend! Couple quick questions: can I use jalapeno for the serrano? Also if I don’t have coconut aminos is there a substitute or can I just skip it? Those are from Food 52! Love their shop. Um, hold on while I eat the entire pot by myself. This looks amazing, and what a good excuse, I mean reason, to have curry for the second time this week– seriously though. So excited to try this ASAP!